I added the snails to the tank on March 5 and left them overnight, so these eggs were less than 24 hours old when I first saw them. I love that you can see a little dot in the center of the mostly clear eggs! Nutritious yolk perhaps? A little cluster of cells that would become the snails? 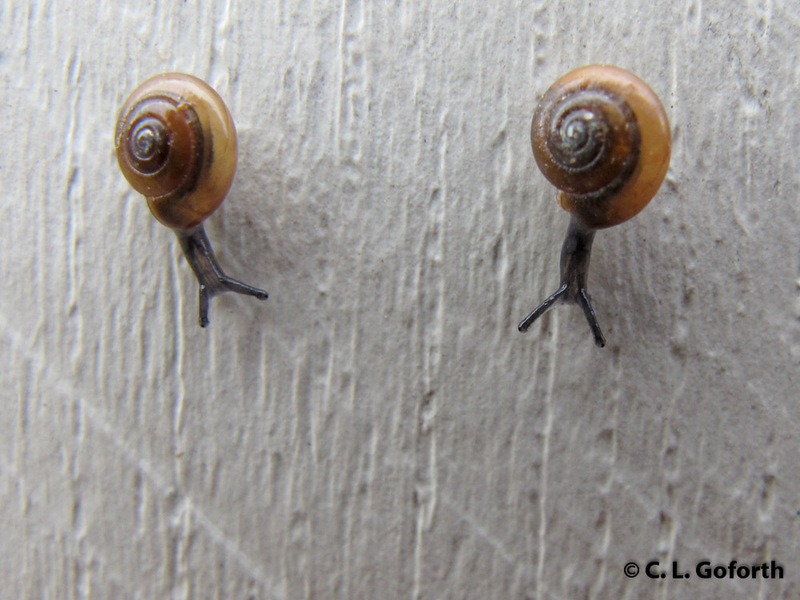 I really have no idea as I know little about snails, but I thought they were rather beautiful. There were lots of clusters like this in the tank. 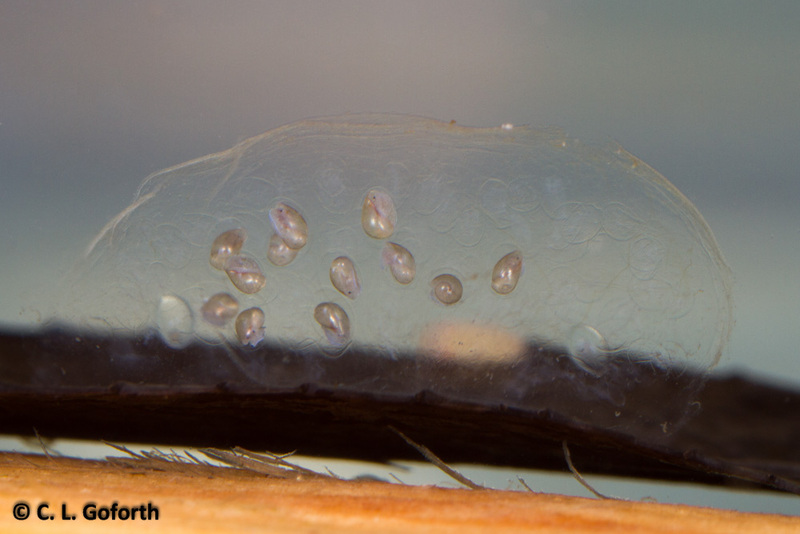 After 6 days, the shape of the little embryos inside the eggs were becoming much more snail-like. You could see some little curved snail bodies and the very beginnings of their shells. The color comes from the light hitting a piece of wood in the tank under the leaf these were laid on – they were largely transparent. The snails were now 11 days old and you could definitely tell they were snails! 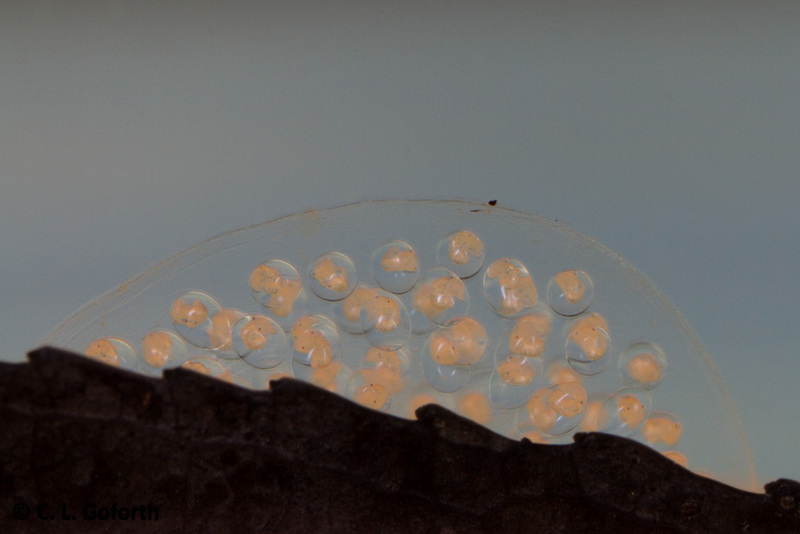 Most of the developing snails inside the egg cluster had mostly to fully developed shells, though still tiny, and had taken on a distinctively spiraled shape. 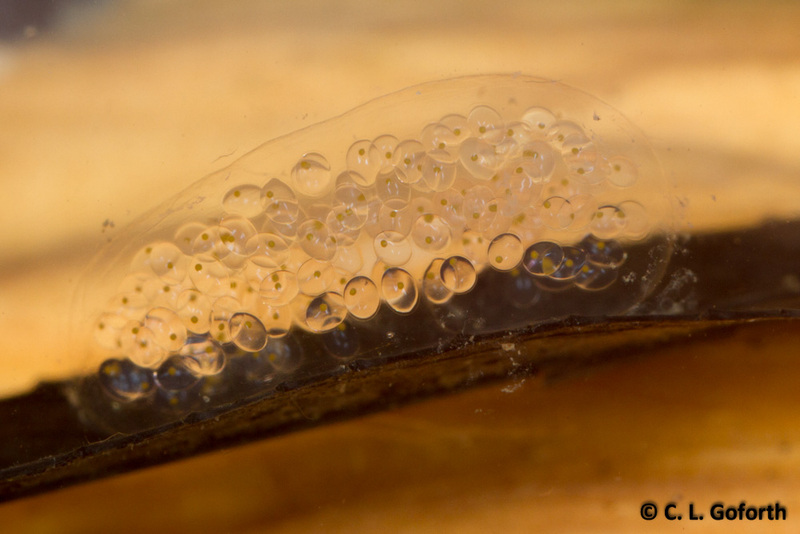 A few had already broken free of their eggs and left the cluster, including the one in the lower right of the egg cluster who is making a break for it in this photo. By this point, most of the snails had escaped the egg cluster, though a few late bloomers were left. 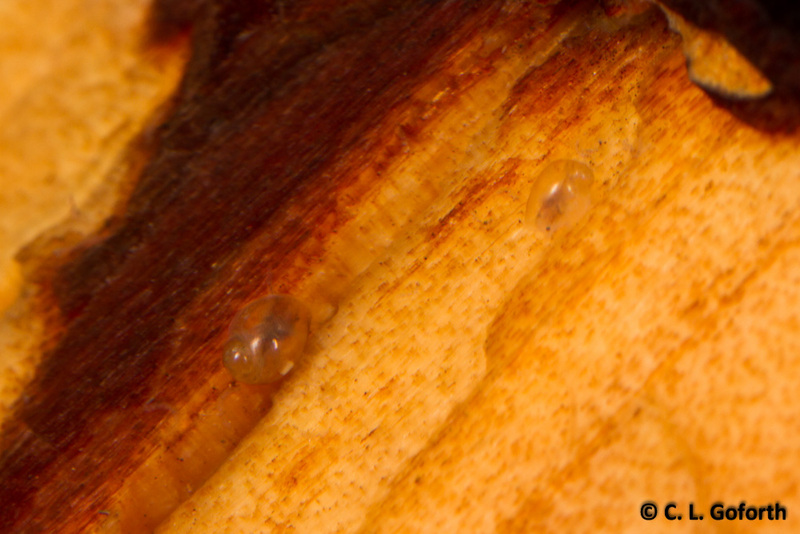 You can still see the leftover egg compartments and the jelly that held the cluster together if you look hard. Looks like there may have been a couple of dud eggs in the lot too that probably won’t ever hatch. Baby snails! There are now about 50 of these on the loose in the tank, each about 2-3 mm long. They’re absolutely tiny – small enough you’d mistake them for shmutz on the glass if you didn’t know what you were looking for – but they move pretty darned fast for such tiny little animals! They’ve spread out across the entire tank in just a couple of days. For some reason, I feel like this is an impressive feat for a 2mm long snail. 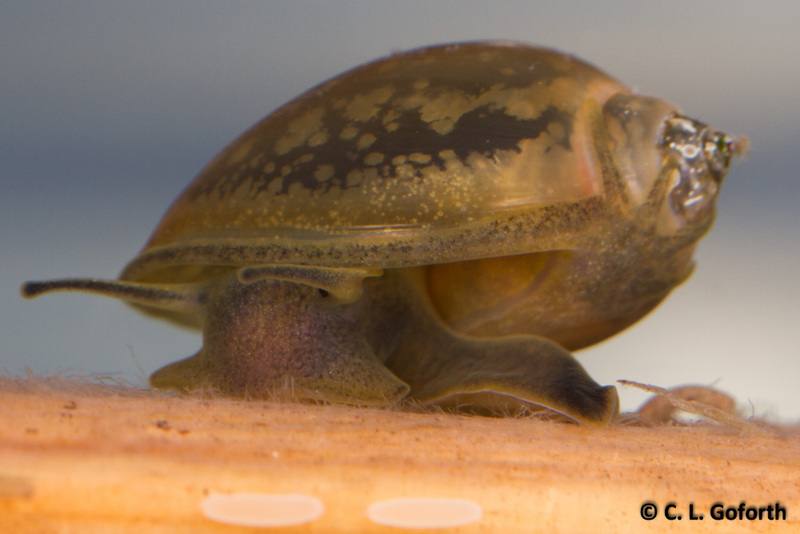 And, now that the baby snails have hatched, I can look at their shells and tell that they are pouch snails and not the ram’s horn snails. That meant that possible baby mama number one above was the parent of dozens and dozens of eggs that are still developing and many more than have already hatched. She was rather prolific in her laying and I just found another clutch today. I’m going to have SO many snails in a couple more weeks! In the meantime, I’m going to enjoy watching these grow. While all of this epic snail drama was going on, I had a similar situation happening with a bunch of backswimmers. I’ll share my baby photos of those guys soon. In the meantime, have a GREAT weekend everyone! Whew! It’s been a really busy few weeks! 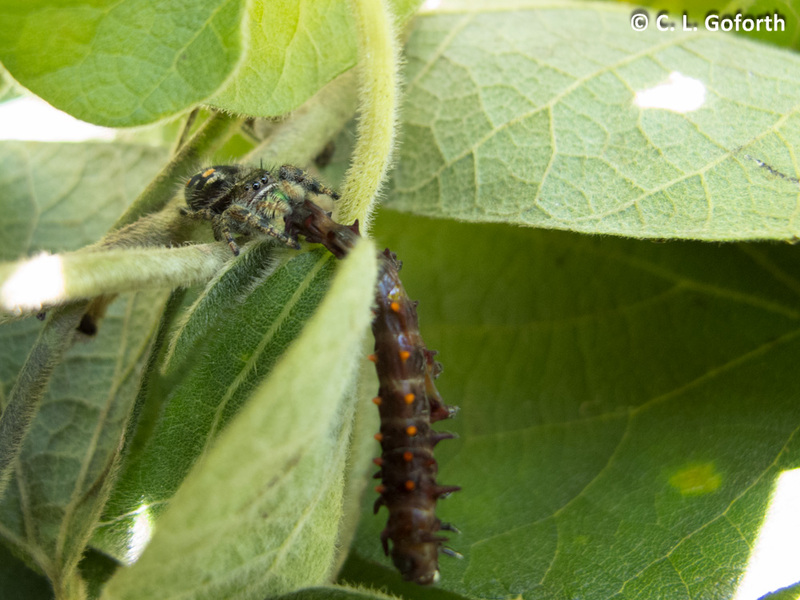 I recently received a grant to start up a citizen science after school program (which you’ll hear all about at some point – it involves bugs!!) and have poured almost every moment of my work time into that since the beginning of February. Then, right in the middle of that chaos, I attended the first ever conference for the Citizen Science Association. That took me to San Jose, CA last week! One conference activity that I really wanted to do and couldn’t was a bioblitz of downtown San Jose. If you don’t know what a bioblitz is, it’s a comprehensive biodiversity survey of an area, typically done over a short (or at least limited) time frame. 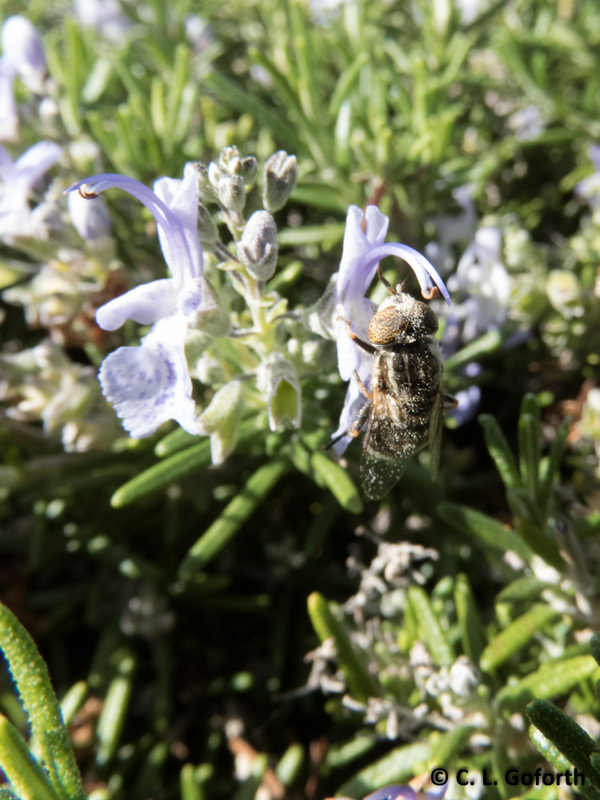 People participating in the San Jose bioblitz were encouraged to photograph any species they saw and upload their sightings to iNaturalist, my favorite wildlife sighting website/app, throughout the meeting. I lead biodiversity survey programs that use iNaturalist all the time and I very much wanted to see what the people who oversee iNaturalist do when they lead programs, but I unfortunately needed to be somewhere else during the organized part of the event. However, the moment I had a few minutes free, I dashed outside with my superzoom camera to add some of my own sightings to the survey! Because it was California, it was lovely and warm and there were actually insects out in the middle of winter. 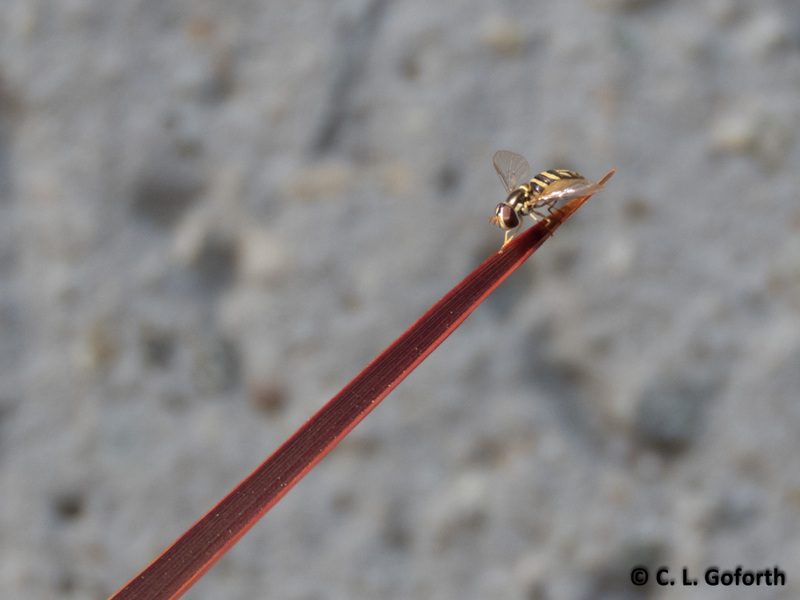 I still haven’t worked out how to use my superzoom to take decent macro shots (I remain unconvinced this is even possible with my particular model…), but here are my five favorite invertebrates I saw in downtown San Jose! I wasn’t at all sure I was going to get anything close to a focused shot of the many hover flies buzzing around the area, but this one’s not too bad, if a little far away… I honestly have no idea what type of hover flies these were (Toxomerus perhaps? ), but I was thrilled to see them. Dozens of hover flies flying around in mid-February! Don’t think I’d realized how much I missed that sort of thing until I found myself standing on a sidewalk in downtown San Jose grinning like a fool and pointing excitedly at hover flies. I would bet several passersby thought I was totally nuts, but whatever. I was just so happy to see insects in winter again! Found this beauty sucking on a rosemary flower! I mistook it for a bee from a distance (how embarrassing! ), but was very pleased to see it was really a hover fly when I got close. The spectacularly speckled eyes make me think this might be something in the hover fly genus Eristalinus (which would probably also make it non-native), but if you couldn’t tell from the previous insect, these are well out of my identification skill wheelhouse. Whatever it is, it’s crazy pretty if you get a good look at it! Makes me feel a little sorry for all those people out there in the world who don’t even know something like this exists. I found dozens of these huge snails in a planter outside an office building and was instantly struck by their beautiful form. One of the nice things about iNaturalist is that you can ask other iNat users for identification help. 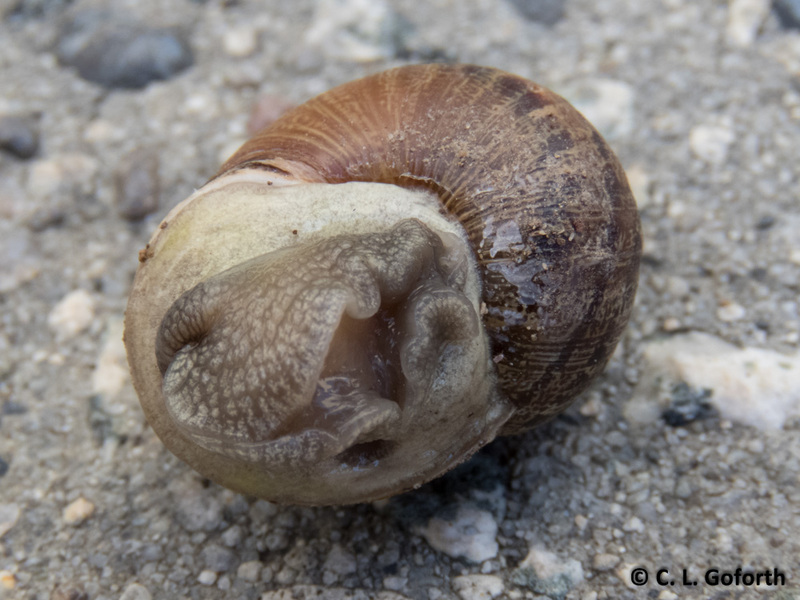 It’s no BugGuide for insects and other invertebrates, but a lot of people came up with the same ID for this one and I think they’re probably right: garden snail, Helix aspersa. 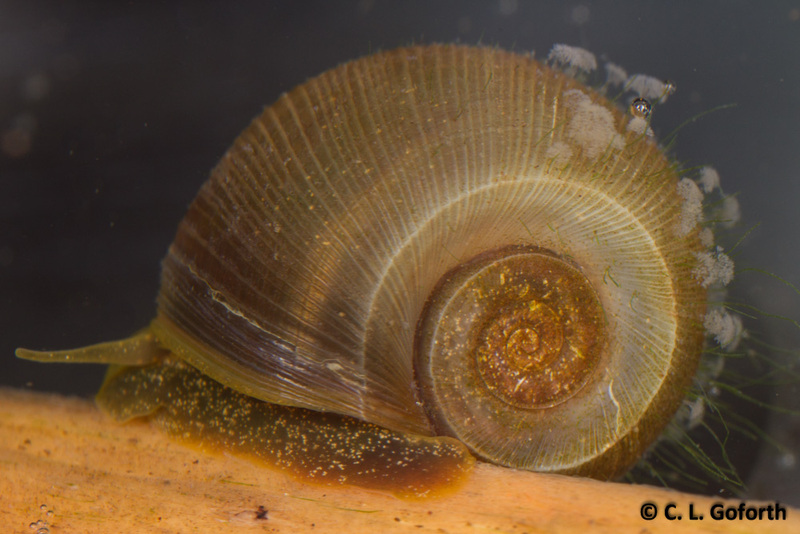 Though we do have a lot of snails in North Carolina, these snails were quite large and were a surprise in the dry environment. They are non-native and considered a pest in California, though these are also one of the snails that end up in escargot in Europe, so apparently edible! Confession time: I have embarrassed many companions by squealing happily when I come across standing water and crouching down beside puddles to poke around for invertebrates. 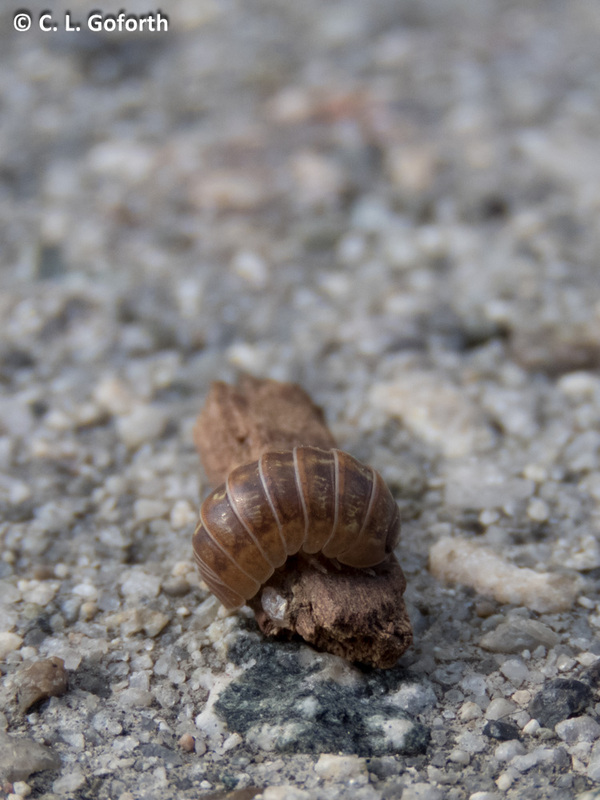 I found this little worm and about a dozen more just like it in a tiny puddle, just 1/4 inch deep, that had formed in a depression at the top of a light fixture in a park. Seriously, people must think I’m nuts… I was wearing a nice skirt, nice shoes, and a nice shirt with my hair pulled back in a tight bun – all business-like – when I yelled “Oooh! Water!! !” to no one in particular and plunged my hands into a random puddle. If you’re ever out in public with me, be warned that I might do the same thing to you. I have zero shame! Who doesn’t love a good roly poly? This one didn’t roll up when I picked it up (sad! ), but I thought its brown pattern was especially lovely for an isopod. These little guys are land-dwelling crustaceans, the lobster of the land! I love that there are little land crustaceans running around all over the place. If I can trust the iNaturalist users, this lovely brown one is the same species as the horde of more standard grey ones I found with it. Was hoping I had two species, but apparently I just found a weird one instead. For those of you that live in places that aren’t buried in snow or covered in a massive sheet of ice, what’s the best invertebrate you’ve seen recently? I want to live vicariously through you – I miss warm winters!! I just love the little tufts of hair coming off the head of this little saltie! I believe this is a Phidippus female, but I’m not 100% sure. If anyone can give me more information, I’d love to figure out what this little beauty is with more certainty! Happy Fourth of July to all you Americans out there! Hope everyone’s enjoying it. Ah, the joys of winter! Snowy, cold weather (at least if you live somewhere other than sunny, warm Arizona like I do!). The air is crisp, icy, and clean. Crunchy dead leaves crackle underfoot as you walk. Weak sunlight filters through spindly, naked tree branches in a feeble attempt to warm the earth. Everything seems to be frozen in place and time. And, apparently, hardly anyone has anything to say about invertebrates! This month’s Circus is compliments of six hearty bloggers, braving the elements to bring you the latest and greatest in spineless news! 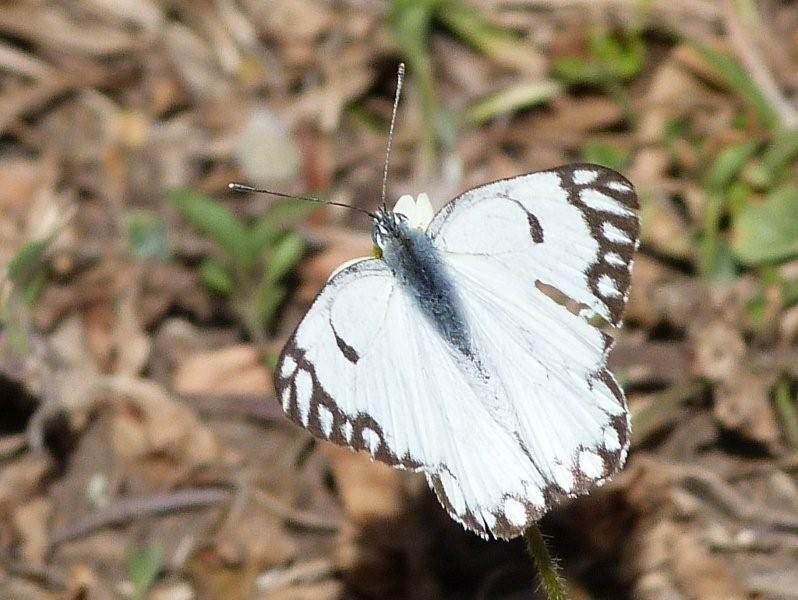 African Common White, Belenois creona. Photo by Colin Beale at http://safari-ecology.blogspot.com/2012/02/butterfly-migration-out-now.html. Of course, not everyone blogs in cold places. For example, there was a fantastic migration of butterflies in Tanzania early in February. Hundreds of white butterflies flew past the awe-struck Colin Beale each minute, and he gleefully documented the event on his blog Safari Ecology. A man after my own heart, he decided to collect some data and invited readers to map their sightings, then posted some preliminary results! Everyone give Mr. Beale a round of applause for taking the initiative to write about an amazing event, then turning the experience into a meaningful scientific data gathering exercise! I for one think this is completely awesome. Hermit crab changes its shell. 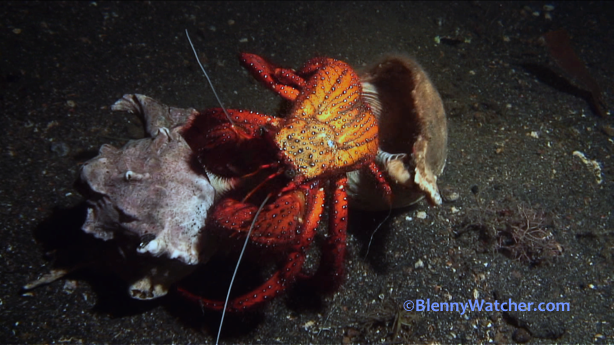 Image courtesy of The BlennyWatcher Blog, Hermit crab changes its shell. A few other intrepid bloggers from warmer climates posted about their own experiences. Anna DeLoach of The BlennyWatcher Blog contributed an excellent story about night diving in Indonesia, hermit crabs, and the joy of new experiences. Ever wonder what the back part of a hermit crab looks like? Now’s your chance! Head on over to BlennyWatcher and take a peek at some naked crabs. Another marine story comes from Zen Faulkes of NeuroDojo who recently discovered a beach full of Portuguese men of war while collecting data. The description of the pain these creatures inflict with a flick of their tentacles is fascinating and the alien blue color of the animals spread across the beach is just wonderful. The post also details the trials and tribulations researchers experience in the pursuit of data. Check it out! Snow fly. Photo by Rebecca Deatsman at http://rebeccainthewoods.wordpress.com/2012/02/18/snow-fly/. And then there’s Rebecca Deatsman from Rebecca in the Woods, the one lone, brave soul who ventured out into the snow-covered north woods for her post’s information. But oh! 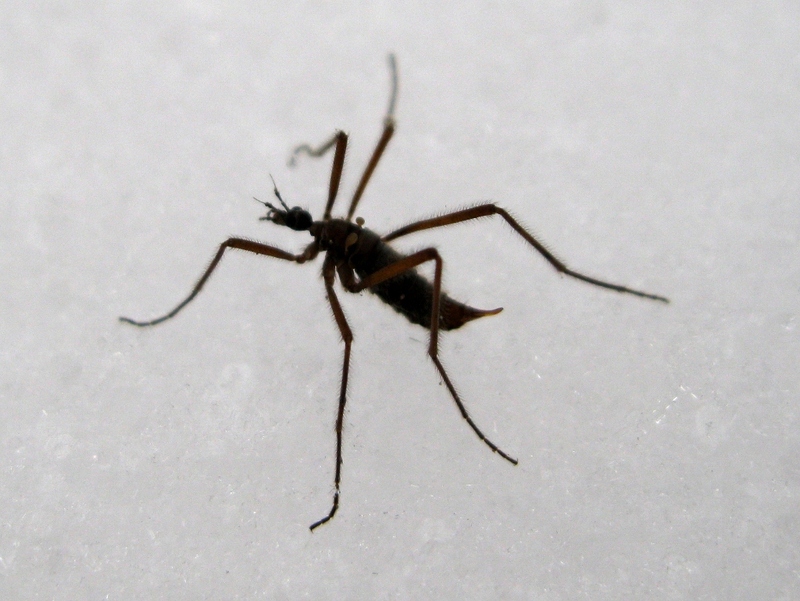 Is there anything better than insects that live on the snow? I think not! Read about Ms. Deatman’s discovery of snow flies in her fascinating post. You won’t regret it. Ever wonder how a spider moves with its freaky unpaired leg muscles? 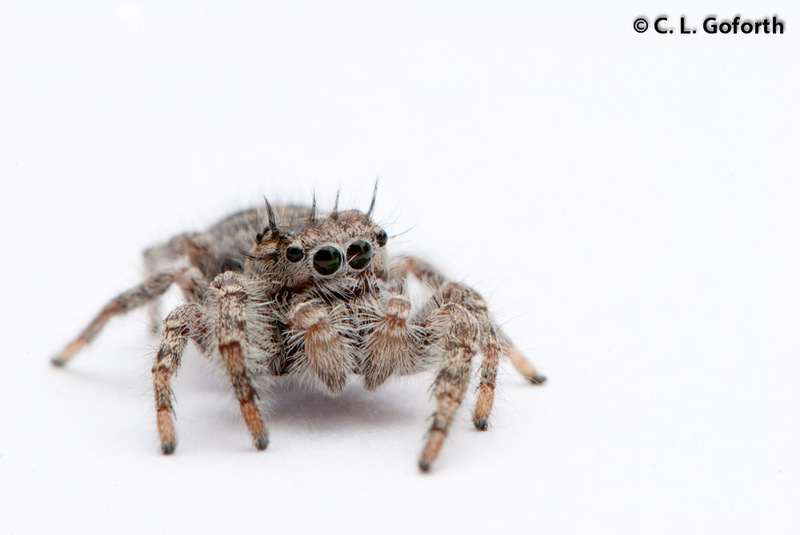 Many small spiders contract their leg muscles and then use hydraulic pressure to move the legs back into place because they lack the second set of muscles necessary to do so. But do bigger spiders do the same thing? 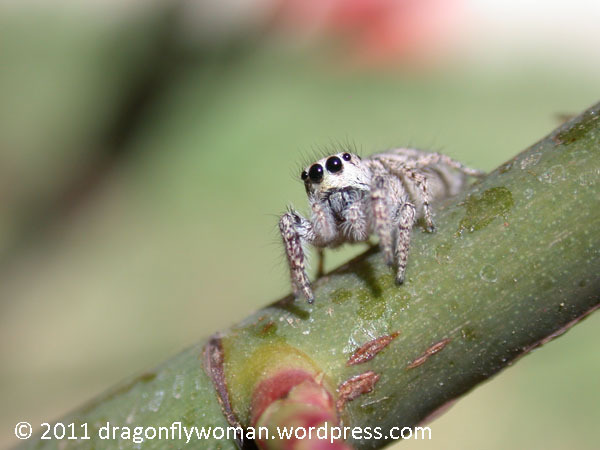 Once again, Mr. Faulkes comes to our rescue, presenting a new paper that suggests that jumping spiders do things a little differently. Check it out. Did you hear about the flying squid? No, this isn’t the start of a bad joke, and boy does Danna Staaf have the story for you! Some squid species launch themselves out of the water and “fly” occasionally rather than swimming constantly. Want to know why? Over on Squid a Day, you’ll learn more about this fascinating behavior, and get to see some of the data from the Ocean Sciences meeting that prompted the recent media frenzy. You know how creatures around deep-sea vents tend to do crazy weird things? In another fascinating post over at NeuroDojo, you’ll learn about the Pompeii worm, a denizen of deep-sea vents that supposedly* holds the record for the animal able to withstand the highest temperature. 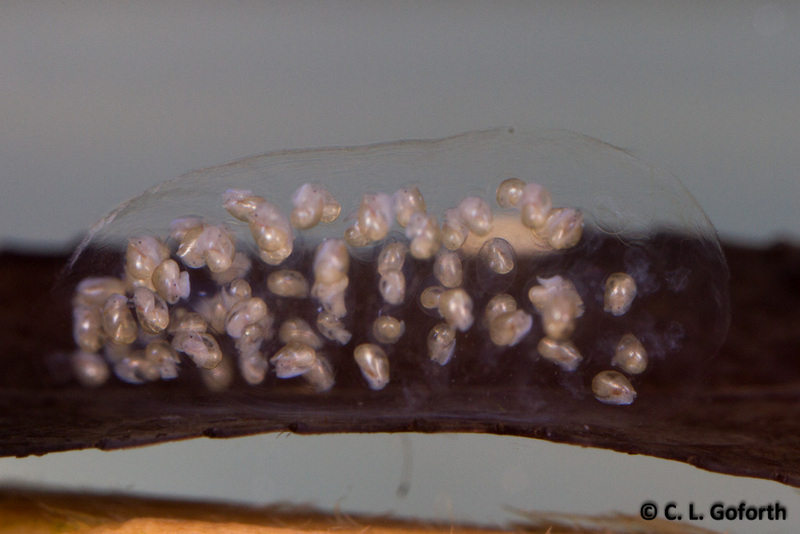 Head on over to NeuroDojo for a glimpse into the lives of these bizarre worms and how they are able to survive those super hot temperatures. Dicosmoecus gilvipes larva. Redrawn from Limm and Power 2011. 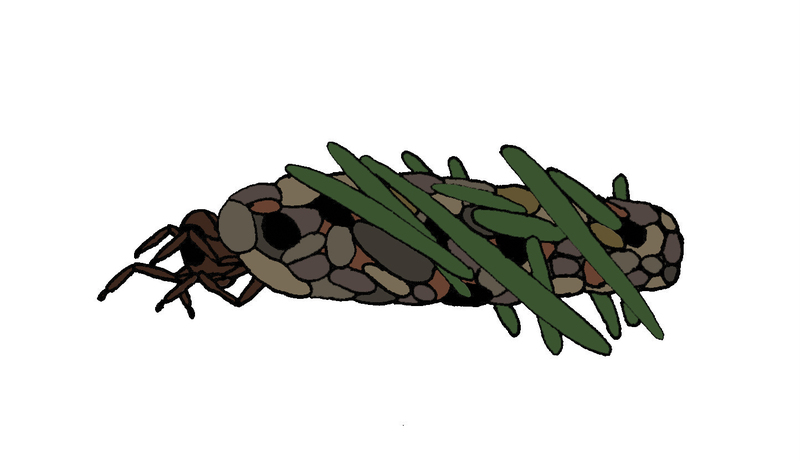 My own contribution to science news featured a paper demonstrating how one species of caddisfly, a funky little aquatic insect that builds cases and drags them around, uses Douglas fir needles to help keep the bugs upright in fast flowing water. 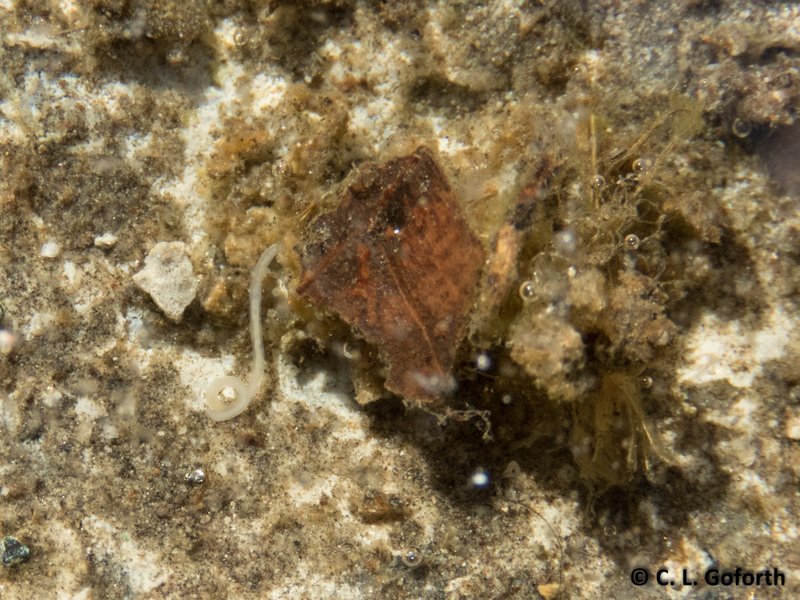 Caddisflies are amazing insects. I think everyone should know at least a few things about them, so I hope you’ll check it out! And finally, I’ll end this month’s Circus with a fabulous music video, compliments of Deep Sea News. Thanks for bringing this spineless gem to our attention! COTS survives because people volunteer to act as hosts. Next month the Circus is headed over to Deep Sea News, so look for more great spinelessness there in early April! Interested in hosting yourself? You can find information at the Circus hub. 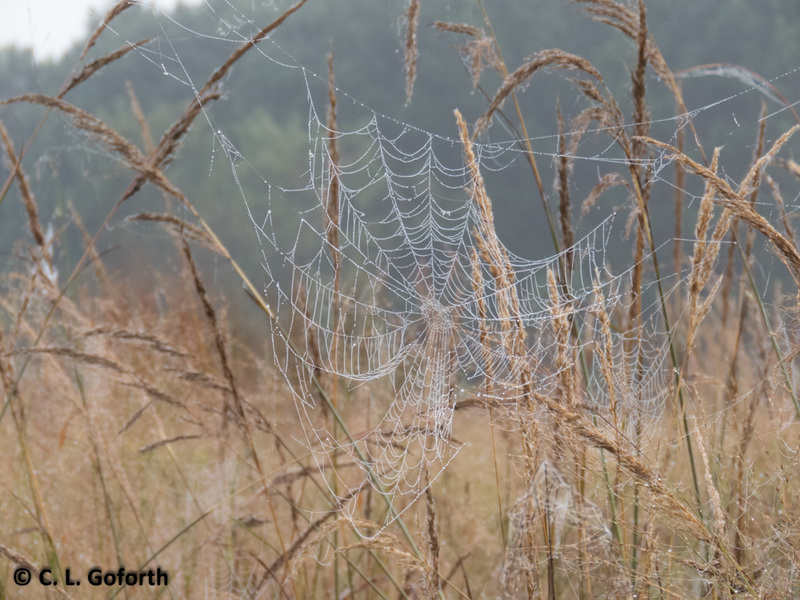 Volunteer and help spread the joy of invertebrates to others! (You know you want to!) After all, even the spineless need love. For my regular blog readers who have NO idea what this is, the Circus of the Spineless is a blog carnival, a monthly collection of posts written by bloggers and submitted to a host blogger, focusing on the backbone-less animals of our planet. These are the posts sent to me by lovers of spineless creatures! Hope you enjoyed this foray outside of the realm of insects, but we’ll return to our regularly scheduled broadcast on Wednesday.